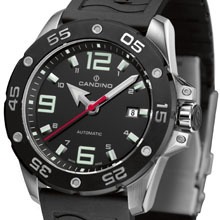 CANDINO, a brand which is deeply anchored in the tradition of Swiss watchmaking, – is enhancing its image by means of its new spirit and its innovative strategy. The sponsoring of PlanetSolar and the launch of cutting-edge products reflect the company's new strategic direction and the long-term positioning of the brand. With the launch of new collections, CANDINO offers a tempting range in a booming price segment, This project fits into the brand’s global expansion strategy. SETTING OUT FOR NEW HORIZONS! TÛRANOR PIanetSolar, the first solar-powered vessel that will circumnavigate the globe, celebrated its public debut in Hamburg before hundreds of thousands of visitors at the International Port Festival. The big media frenzy surrounding the boat and its revolutionary propulsion technology have already made the vessel a celebrity before it has even set off on its around-the-world journey. The watch collection "PlanetSolar", a series of the highest quality with the label “Swiss Made”, has been developed in the context of this project. Elements of solar cells, water and dynamism distinguish this line of sport models and are meant as a tribute to this unique adventure. Every watch from this sporty collection comes with an Automatic (ETA 2824) or quartz movement, a sapphire crystal, and a metal or PU (polyurethane) strap. The heart of the collection is a 100 piece Limited Edition, ETA 2892, with 40-hour power reserve, available in fine specialty stores this autumn. Through its involvement with PlanetSolar, not only is the FESTINA group setting a milestone for the future, but also it is following in the footsteps of its founder. In spite of its new dynamic, CANDINO stays true to its principles: quality and responsibility. 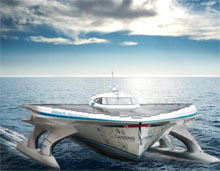 - September 2010 or spring 2011: Launch in the Mediterranean to start the first global circumnavigation with solar energy! 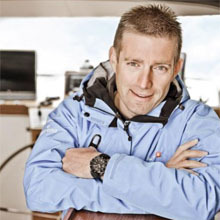 Raphaël Domjan (Photo) – The adventurer from Neuchâtel is a consummate fan of solar energy and technology and has been dreaming for years of such a world circumnavigation. He is convinced that our planet deserves better treatment than in the past and created PlanetSolar to live out both his passions. Gérard d’Aboville – In 1980, he was the first to cross the Atlantic in a row boat. Eleven years later, he made a fabulous Pacific crossing. He has been involved in the project from the beginning, and his maritime experience makes him an important consultant to PlanetSolar.